Mao and Stalin China and Russia share a 2,164 miles (3,483 kilometers) border. They have a history of mutual suspicion and hostility and remain suspicious of another despite their improved ties. Russia and China have disagreed over the exact location of their common border since the 17th century. China once considered large chunks of Siberia and the Russian Far East as part of its territory. Russians began settling permanently in the Amur region in the mid-1850s. A treaty with the Chinese emperor gave them the north bank of the Amur River. At the time, the Chinese said the agreement was temporary. Chinese and Koreans living in the area were used as cheap labor to build the Trans Siberian Railroad..
After the Boxer Rebellion, in which a handful of Russians were attacked by Chinese, the Cossacks took revenge by launching an ethnic cleansing campaign on the Russian side of the Amur. Chinese men, women and children were herded to the river and told to swim to China. Most of those who tried to swim drowned, froze to death or were swept away by the current. Those that refused to swim were massacred. It is believed that 5,000 Chinese were killed around the Russian town of Blagoveshchensk from July 4 to July 10, 1900. Russian and Chinese engineers Despite common ideological roots and considerable Soviet assistance in over several decades, relations between China and the Soviet Union began to sour in the 1950s and got so tense that for a while China considered the Soviet Union to be its No. 1 enemy, presenting more of a threat than the United States.The relationship between China and the Soviet Union were strained by cultural differences between the two countries, personal difference between their leaders and ideological difference over the ways Communism was interpreted and implemented. Tensions in relations between the two countries had began to escalate in the mid-1950s. China was angry with the Soviets for failing to fulfill their promise to help China build a nuclear bomb and for siding with India during its border dispute with China. 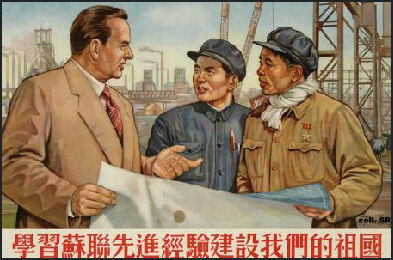 The urban-based Soviets and the rural-oriented Chinese had different concepts of what Communism was all about. 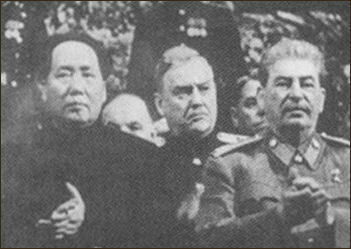 Mao, a firm believer in world revolution, was also angered by the Soviet Union's relatively amicable relationship with the United States. 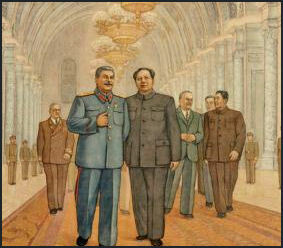 China and the Soviet split over ideological differences in the 1950s when with Khrushchev de-Stalinization speech, condemning personality-cult leadership, at a time when Mao was using a personality cult to push ahead the Great Leap Forward. In 1958, Mao Zedong welcomed Nikita Khrushchev in swimming trunks and invited the Soviet leader to join him for a swim even though he knew Khrushchev couldn't swim. The Soviets withdrew their technical advisors from Chinese factories and weapons plants and demanded payment on loans. in 1960. A bridge over the Yangtze is a famous landmark in China because it was started with the help of the Russians, who pulled out when it was half done, believing the Chinese could never finish it, but the Chinese did. Relations between China and the Soviet Union worsened when armed clashes broke out on the poorly defined border in the late 1960s. The 1968 Soviet invasion of Czechoslovakia and the buildup of Soviet forces in the Soviet Far East raised Chinese suspicions of Soviet intentions. Sharp border clashes between Soviet and Chinese troops occurred in 1969, roughly a decade after relations between the two countries had begun to deteriorate and some four years after a buildup of Soviet forces along China's northern border had begun. Chinese and Russian soldiers fought along several sections of the border, resulting in hundreds of deaths. Based partly on Manchu claims to the region, Mao said Russia had imposed unfair borders on China and Vladivostok and Khabarovsk in the Russian Far East belonged to China. In one disputed area, along the Amur River, Chinese soldiers taunted the enemy by dropping their pants and mooning the Soviet guards on the other side of the border. Particularly heated border clashes occurred in the northeast along the Sino-Soviet border formed by the Heilong Jiang (Amur River) and the Wusuli Jiang (Ussuri River), on which China claimed the right to navigate. In 1969, Chinese and Soviet soldiers fought a bloody battle on Damansky Island in the Ussuri River in the Russian Far East. The fighting stopped short of all-out war but launched a massive military build up on both sides of the border and triggered a protest in Shanghai on March 3rd and 4th 1969, with 2.7 million demonstrators (a world record). In the 60s and 70s, the border between China nd the Soviet Union was tightly sealed. Border provocations occasionally recurred in later years--for example, in May 1978 when Soviet troops in boats and a helicopter intruded into Chinese territory--but major armed clashes were averted. “In the late 1970s, China decried what it perceived as a Soviet attempt to encircle it as the military buildup continued in the Soviet Far East and the Soviet Union signed friendship treaties with Vietnam and Afghanistan. In April 1979 Beijing notified Moscow that the thirty-year Treaty of Friendship, Alliance, and Mutual Assistance--under which the Soviets aided the PLA in its 1950s modernization--would not be renewed. China joined the boycott against the Moscow Olympics in 1980 and participated n the 1984 Olympics in Los Angeles, which the Soviet Union boycotted. In the mid-1980s the Soviet Union deployed about one-quarter to one-third of its military forces in its Far Eastern theater. In 1987 Soviet nuclear forces included approximately 171 SS-20 intermediate-range ballistic missiles, which China found particularly threatening, and 85 nuclear-capable long-range Backfire bombers. Approximately 470,000 Soviet ground force troops in 53 divisions were stationed in the Sino-Soviet border region, including Mongolia. Although 65 percent of these ground force divisions were only at 20 percent of full combat strength, they were provided with improved equipment, including T-72 tanks, and were reinforced by 2,200 aircraft, including new generation aircraft such as the MiG-23/27 Flogger fighter. Chinese forces on the Sino-Soviet border were numerically superior--1.5 million troops in 68 divisions--but technologically inferior. In the late 1980s, China viewed the Soviet Union as its principal military opponent. Simmering border disputes with Vietnam and India were perceived as lesser threats to security. Although the PLA units in the Shenyang and Beijing military regions were equipped with some of the PLA's most advanced weaponry, few Chinese divisions were mechanized. The Soviet Union held tactical and strategic nuclear superiority and exceeded China in terms of mobility, firepower, air power, and antiaircraft capability. Chinese leaders reportedly did not consider a Soviet attack to be imminent or even likely in the short term. They believed that if the Soviets did attack, it would be a limited strike against Chinese territory in north or northeast China, rather than a full-scale invasion. Medvedev in China April 2011 China and Russia currently have what the call a “strategic partnership.” The two countries are trying to increase trade, boost their economies and are united in their determination to keep the United States from dominating world politics. China is the biggest foreign buyer of Russian arms. It also desperately wants Russian oil. Relations improved in 1989 when Gorbachev visited Beijing, ironically right before the Tiananmen Square massacre. Yeltsin visited China in April, 1995 and received "what may be the warmest welcome ever accorded a Russian leader in China." Chinese President Jiang Zemin and Yeltsin in signed a series of peaceful cooperation accords in 1994 in Moscow. In the agreement China and Russia promised to stop targeting nuclear weapons at each other. They also settled the dispute over a 34-mile section of the Sino-Russian border, where a skirmish in 1969 resulted in several hundred deaths. In November 1997, Yeltsin and Jiang Zemin signed an agreement on border and joint water use. In July 2008, China and Russia signed a pact that finally settled the demarcation line of their 4,400-kilometer border and have cut troop levels along the Sino-Russian border. China has purchased billions for dollars of weapons while Russia has quietly given Bolshoi Ussurisky Island back---a 130 square mile (335 square kilometer) island is located in the Amur River near Khabarovsk---back to China. Some speculated the move might be a preview to a transfer of the Kuriles to Japan. Russian nationalists are not happy about these moves..
One of Dmitry Medvedev’s first moves as the new Russian president in 2008 was visit China. "In the coming years, while relations will remain close at the diplomatic level, the two cornerstones of the partnership over the past two decades -- military and energy cooperation -- are crumbling," the think-tank wrote. "As a result, Russia's significance to China will continue to diminish." While both work closely at the United Nations and frequently oppose U.S. policies or Western demands for sanctions on countries like Syria, China and Russia also value their relationship with Washington, the report said. "Furthermore, there are strategic planners in Beijing and Moscow who view the other side as the ultimate strategic threat in the long term." China once relied significantly on Russia for weapons. But dramatic advances over the past few years mean that China will actually become a competitor to Russia on the world stage. That is one reason why Russia does not wanted to export its most high-tech equipment to China, the report said. "A more advanced Chinese defense industry is increasingly able to meet the needs of the PLA (People's Liberation Army), limiting the need for imports of large weapon platforms," it said. "At the same time, it is unclear if Russia is able and willing to meet Chinese demands because of problems with its own arms industry and concerns that China will copy technology and compete with Russia on the world market." In energy cooperation, ties have frayed, as the sides argue about details of oil and gas imports into China and as Beijing turns to other suppliers, notably in central Asia, SIPRI said. A $1 trillion deal to supply Russian gas to China over 30 years, supposed to be the high point of President Hu Jintao's visit to Russia in June, has failed to materialize. Sources close to talks said price differences between the world's largest energy producer and Beijing were still too big. "China is now in a position to have greater expectations of and place demands on Russia, while Russia is struggling to come to terms with this new power dynamic," the report said. "In both countries, strategic planners warn that the present competition could escalate to a more pointed rivalry, entirely undermining the notion of a strategic partnership. "Consequently, China and Russia will continue to be pragmatic partners of convenience, but not partners based on deeper shared world views and strategic interests." Trade between Russia and China was around $33.4 billion in 2006, just 2 percent of China’s total trade. While parts of Russia are flooded with Chinese goods, about all that Russia sells to China are military hardware and natural resources. Much of it is Russian oil which arrived in tank cars by train on the Trans-Siberian Railroad. The cars carry 15 million tons of oil in 2006 and 10 million in 2005. China is beginning to place great importance on its relationship with Russia as is becomes major supplier of China’s energy and one that is right at its doorstep. In September 2010, China and Russia signed a series of energy and security deals and promised to boost their strategic partnership. The agreements covered a range of topics such as terrorism, nuclear energy, coal, aluminum, and banking. During th meeting Russian President Dmitry Mevedev and Chinese President Hu Jintao marked the 65th anniversary of the end of World War II and announced the completion of a Russia-China oil pipeline. Moscow is anxious to earn money by selling arms and China is anxious to modernize and build up its armed forces. China buys about $1 billion worth of military stuff from Russia each year. It is the biggest foreign buyer of Russian arms and Russia is China’s main weapons supplier. Russia and China have been cooperating in military matters and sharing foreign intelligence since the early 1990s. In August 2005, Russia and China held joint military exercises called “Peace Mission 2005,” involving submarines, warships, helicopters, war planes, thousands of troops and some of the Russia’s most advanced technology. The Exercises were held near Vladivostok in the Russian Far East and on the Yellow Sea near Shandong in China. In one live fire drill, 1,800 Russian and 7,000 Chinese troops launched a mock assault of the beaches of northern China while top generals from both countries sat at a desk together and watched. The exercises also included a simulated naval blockades, which included the firing of missiles and rockets while military music blasted from shipboard speakers. China and Russia said the military exercise were part of their preparations to fight terrorists and insurgencies and “didn’t threaten any country.” Some analysts saw them as a demonstration to the United States that it was not a unilateral global power and a warning to Taiwan and Japan not to overstep their bounds. Others saw them primarily as a chance for Russia to show off its latest weapons to it best customer. Russian and Chinese forces held another joint military exercises together in August 2007 in the southern Urals at Chebarkul testing Range. The maneuver involved about 6,000 troops from Russia, China and four Central Asian countries. The European Union’s policy towards China has been described as lacking coherency with a number of different ideas on the table addressed in different ways by different countries. Depending on who you talk to China is seen as economic opportunity, major polluter and greenhouse gas producer, a human rights violator, a friend of intransigent dictators, a resource guzzler, a strategic partner, a geopolitical threat and trade headache. For the EU trade is a major issue but for individual countries in the EU global warming, Tibet and human rights are also very important. The EU’s trade deficit with China was $247.4 billion in 2007. Chinese nationalism in regard to the West has been described as “isolationism shading into xenophobia.” The Cantonese term for Europeans and Americans is gweilo, which literally translates to "foreign devils." China's attitude toward the West still seems colored by the indignities that were inflicted on it during the colonial period. "China," said scholar Gerald Segal, has "not just a chip but a boulder on its shoulder." Feelings of xenophobia are reinforced in the education system and inflamed by the government. Schoolchildren are reminded of humiliation brought upon China by Western nations and news reports are censored and edited to portray the United States and other Western countries in a bad light. The European Union has tried to pressure China to reduce greenhouse gases and has battled with China over trade issues (See Trade, Textiles). It has an arms embargo with China because of its human rights abuses. China has approached NATO for dialogue. China won some brownie points in Europe by buying up bonds from Greece and Portugal in 2010 when those two countries were suffering economic crises that threatened to undermine the Euro and bring down all of Europe with them. China offered to invest $5.2 billion in Portuguese government debt in the first quarter of 2011. This display of willingness on the part of China was enough to bring some calm to markets in Europe. 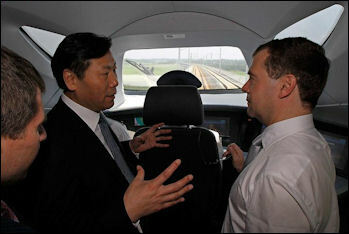 In June 2011, Chinese Premier Wen Jiabao said China was ready to support the euro in the midst of eurozone’s debt crisis. Beijing has long demanded that the EU and United States accord China full market economy status, a technical designation that would remove certain restrictions to Chinese exports and investments in Europe.China has invested an increasing portion of its world-leading foreign exchange reserves in euro-denominated assets, and its leaders have repeatedly expressed confidence in the region's economies during the debt upheaval. EU leaders have said in the past that the Asian giant has not yet met the necessary conditions, pointing out that most of China's largest companies are state-owned and their leaders appointed by the government. Wen also urged action to halt the spread of the sovereign debt crisis that has sent global markets plummeting, and said governments should work harder to maintain investor confidence. China is sitting on more than $3 trillion in foreign currency reserves and has already committed to investing in Greece, Spain and Portugal. "Sovereign debt risks are growing in some countries, causing turbulence on the international financial market," Wen said. Germany had a concession in Shandong in the colonial period. In 1995, bilateral trade between Germany and China was valued at $17.6 billion. In 1996, Germany froze official contacts with China in a dispute over Beijing's human rights record in Tibet. In 2007, Beijing was angered by a meeting between German Chancellor Angela Merkel and the Dalai Lama. 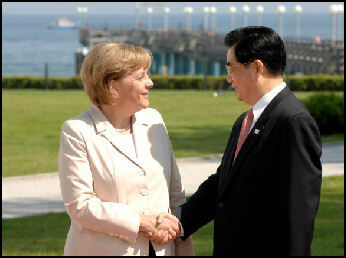 Hu Jintao and the leader of Germany The French had a concession in Shanghai. They built a railroad from Vietnam to Kunming in the Yunnan province of southern China so they could sell French products to the Chinese, buy thing like silk, minerals, furs and precious stones and exploit deposits of tin and cooper and lumber. This railway, which has recently reopened, was a vital link between Southern China and Southeast Asia. Until recently is was easier to get goods to Kumming from Hanoi than from Shanghai. Beijing was very angry with French President Nicolas Sarkozy for meeting with the Dalai Lama in December 2008. At that time Sarkozy was also the acting EU head and China cancelled an important China-EU summit meeting during the 2008 financial meeting because of the Dalai Lama meeting. By early 2010, France and China were working to improve relations. French President Nicolas Sarkozy, accompanied by his singer wife, Carla Bruni-Sarkozy, was the most high-profile leader to show up for the Opening Ceremonies of the 2010 Shanghai Expo. In the 1990s France was in China’s doghouse for selling weapons to Taiwan. But those days seem to be over. French President Nicolas Sarkozy, accompanied by 270 officials, businessmen and journalists, was given a warm welcome during a visit in 2007. Over $30 billions of dollars worth of trade deals were signed during the trip despite unwelcome urging by Sarkozy for China to revalue the yuan and do more to tackle global warming. In recent years France has been a leader in trying to get the European Union to drop its arms embargo against China. In 1995 France only had 1.7 percent share in the Chinese market. French projects included a gas-liquification plant, Citreon auto plant, grain sales and the sales of Airbus planes. When France sold some fighters to Taiwan, China closed down its consulate in Guangzhou and awarded a big contract the French were expecting to get to the Germans. In the 1990s, a dinner party to celebrate the signing of several lucrative contracts---including one worth $1.95 billion for 30 Airbus 320 aircraft---was delayed for two hours when French Prime minister Alain Juppe decided to bring up the subject of human rights in his speech. Juppe ended up removing the embarrassing paragraph from his speech and the dinner went on but neither nation toasted the other.